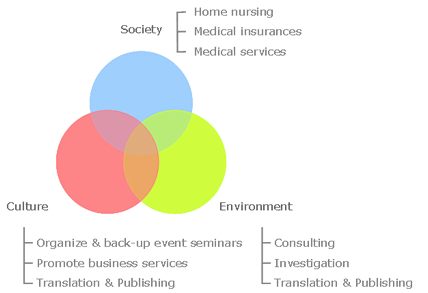 Our missions focus on three key elements that comprise our daily life: SOCIETY, CULTURE and ENVIRONMENT. They interact among each other either negatively or positively, while our life style alters and social system becomes more advanced. Many present issues therefore require complex approaches to solve problems relating to these elements. Our contribution to SOCIETY is to carry out medical services for local communities around our head quarter office. We provide home nursing for those who need to have an everyday medical treatment stayed at home, and for those who need professional medical supports to the patient of their family member. Our contribution to CULTURE is to promote the adaptation and/or harmonization of our authentic traditions to the modern life styles, which are disappearing through structural changes in our life styles. We promote cultural seminars, workshops and events in- and outside of Japan. In addition, we arrange international cultural exchanges by means of international seminars/workshops and translation to understand diverse culture and tradition better. Our contribution to NATURAL ENVIRONMENT is to carry out consultancy and field investigation towards appropriate sustainable management aiming at both economic development and ecosystem management for our future well-being. Name of Company: Melcer, Inc.